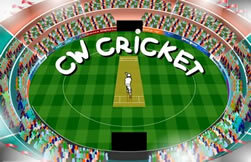 Welcome to Cricket Web's gaming section, test your knowledge, memory and boundary hitting ability in a selection of fun filled games to keep you busy for hours! There are currently 168,541 people registered with CW Games! The latest and greatest addition to Cricket Web family. This long awaited flash cricket game is sure to keep you entertained for hours on end! Slog a six, perfectly time a cover drive for four or scamper through for a single, you can do it all in this new state of the art flash game. Take your favourite side for a test drive today! Over 150,000 teams and still growing! Find out why this competition is so popular and show everyone once and for all why you'd be the best selector in international cricket. 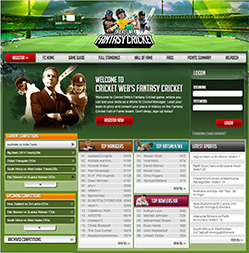 Fantasy Cricket has competitions for all Test, ODI and Twenty20 series. Get involved! 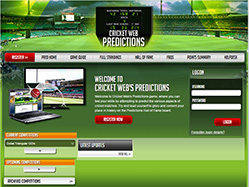 Test your skills by attempting to predict the various aspects of cricket matches. Try and lead yourself to glory and cement your place in history on the Predictions Hall of Fame board. Save the cricketer from his horrible fate by guessing the word before the hangman strikes! For each wrong guess, the cricketer approachs his terrible demise. Test your memory with this classic and reinvented board game. The aim is simple; match all the pictures of modern cricketing heroes, one by one. The catch is you can't have any two pictures showing at the same time. Your score is based on the level you play, the quicker you complete the board and how many mistakes you make.